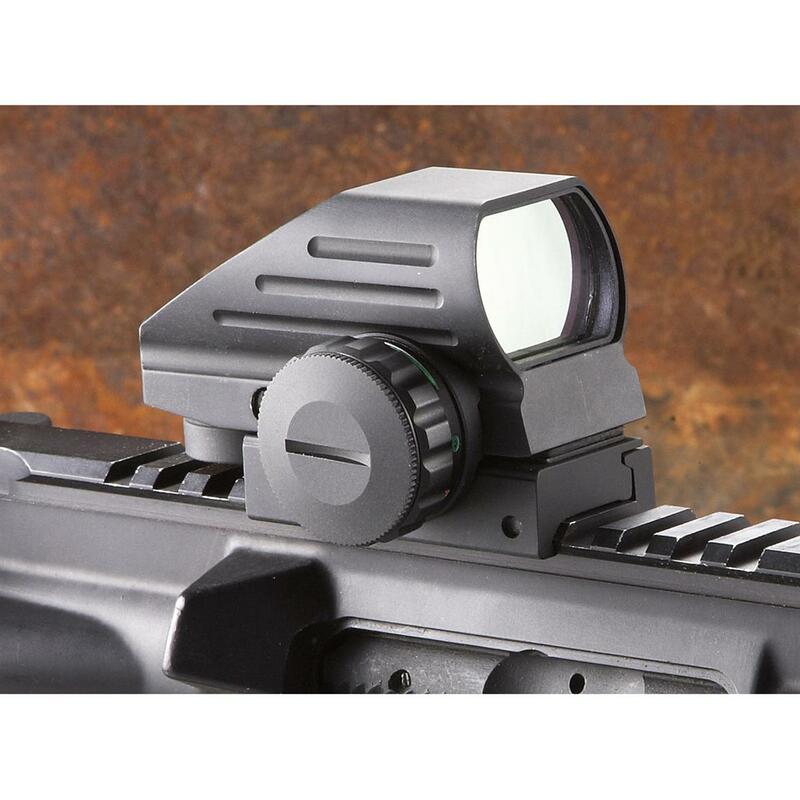 Super-versatile Extreme Tactical® Mini Multi-reticle Sight offers 4 reticles, plus brightness control to suit any setting! Built for just about any situation, the Mini Multi-reticle Sight from Extreme Tactical® is ready to handle your next hunt! Features 4 reticles (dot, dot in circle, dot in crosshairs, crosshairs) and 3 brightness settings to give you the best shot, morning, noon and night! And with shockproof, fogproof and highly water-resistant construction, you'll get the same performance whether it's hot, cold, raining or "just right." Extreme Tactical Mini Multi-Reticle Sight is rated 4.3 out of 5 by 66. Rated 5 out of 5 by JGF1968 from Always Impressed With Sportsmans Guide I have ordered Guns, scopes etc and have always impressed with the shipping the product and service from Sportsmans Guide.My Mini Multi-Reticle sight is another item I am happy with. Rated 1 out of 5 by dublf from Disappointed Delivered missing battery and lens cover. Appears to be returned item. Disappointed in the SPG. Difficult to rate quality or value when sent in this condition. Rated 4 out of 5 by Mule man from Good product for the price Easy to mount and sight inrounds had no issues. Quick to locate target. Rated 5 out of 5 by Drae from Value Priced This works really good out to about 50 yards. I use this on my A4 for home defense. The green and red sights do not align so you must use one or the other. I like that once you sight it in it has a lock screw to keep your settings. Rated 5 out of 5 by HNOII from Price/Quality Ratio Makes This a Good Choice I bought one of these a few years ago and I use it on my Hi-Point 9 MM carbine, which, for all those out there snickering, I happen to love. It is not the highest quality red dot, but for the price, for ordinary shooters, you cannot beat it. I have another fun gun to which I decided to add a red dot, and I liked the one I had so much I recently bought another one.One point to note: do not leave a battery in it for transport, even for a short time. It is very easily switched on in a gun case and your battery runs down. Rated 4 out of 5 by vagrayghosts from Good Sight Optics are clear and highly visible. Sight adjustment is a bit rude but for the money a good sight. Seems durable enough as well. Rated 5 out of 5 by upstate new yorker from good bang for the buck Multi-Reticle had good weight to it, was a very easy install and was quick to zero in. It has a very good battery life. We like the 2 color choices. The choice of 4 different reticles since 2 of us use this rifle, is nice as well. Put on a 44 Mag rifle and now the wife has stolen the rifle to hunt with. Also, the cost was an added bonus. Would recommend. Rated 3 out of 5 by Silverstring from Nice looking, well made - easy to zero I had hoped to use this on my new Mark IV 22/45. However in full sun the reticles/dots aren't bright enough for my old eyes. So I moved it to my HP 9mm carbine , which gets my eyes closer to the site. So the bright sun doesn't get in the way so much. Also you must decide which color (green/red) to use, then zero in. The reticle is not consistent between to two colors. Ex: zero in using red, then the green reticle will be approx 2 MOA low.